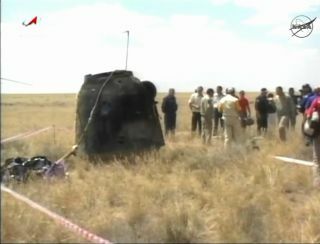 The Soyuz TMA-03M space capsule that returned to Earth on July 1, 2012 with three astronauts from the International Space Station is shown in this NASA TV still image. The Russian Soyuz TMA-03M landed in the steppes of Kazakhstan in Central Asia to end the Expedition 31 mission. This story was updated at 5:03 a.m. ET. After half a year living on the International Space Station, three astronauts safely returned to Earth Sunday (July 1) aboard a Russian-built space capsule. The Soyuz spacecraft landed on Central Asian steppes of Kazakhstan at 4:14 a.m. EDT (0414 GMT) to return NASA astronaut Don Pettit, Russian cosmonaut Oleg Kononenko and Dutch astronaut Andre Kuipers back to their home planet. The spaceflyers had undocked from the space station several hours earlier in their Russian-built Soyuz TMA-03M spacecraft to begin the journey home. They landed upright under a blue sky dotted with some white clouds in Kazakhstan, where the local time was Sunday afternoon. Pettit, Kononenko and Kuipers arrived at the orbiting outpost in December 2011. All three had flown previous missions to the space station, making them a crew of veteran spaceflyers. In a blog post describing his final day in space, Pettit reflected on the impact of his months-long mission, and encouraged humanity to keep pushing the boundaries of space exploration. Expedition 31 Flight Engineer Don Pettit took photos of star trails, terrestrial lights, airglow and auroras while aboard the International Space Station. Image taken May 17, 2012. Throughout their mission, Pettit and Kuipers shared with the public stunning photos of the Earth from space through Twitter and the photo sharing flight Flickr. Pettit also regularly updated a blog about his experiences on the space station, which included several poems in tribute to life in space. Pettit also kept a journal as a fun way to document his scientific activities on the orbiting outpost. For instance, Pettit wrote blog updates in the voice of a zucchini plant when he experimented with growing different kinds of plants in microgravity. On Friday (June 29), Pettit wrote a poem called "Last Day in Space," to reflect on the memories of the mission, the experiences that moved him, and his anticipation over seeing his wife and children again soon. Pettit, Kononenko and Kuipers made up half of the station's Expedition 31 crew. During their stay at the orbiting laboratory, the spaceflyers rolled out the welcome mat for the first commercial spacecraft to visit the station. SpaceX's unmanned Dragon capsule was launched to the International Space Station on a test flight to demonstrate the spacecraft's ability to carry cargo to and from low-Earth orbit. As Dragon approached the station, Pettit and Kuipers used the outpost's robotic arm to pluck it from space and manually park it to the complex. The successful test flight lays the groundwork for NASA to use commercial spaceships to ferry cargo, and one day astronauts, to the space station. SpaceX holds a $1.6 billion contract with the agency for 12 unmanned cargo delivery flights. Sunday's Soyuz landing placed Pettit fourth in the ranks of most experienced American astronauts. He now has a total of 370 days in space during his three missions, two of them as part of a space station crew. Kononenko ended the flight with 392 days, a total that he accrued during two separate long-duration stints aboard the station. Kuipers ended the mission with 204 days of career spaceflight time. Kononenko served as commander of Expedition 31 during his stay, but passed the torch to fellow Russian cosmonaut Gennady Padalka in an official change-of-command ceremony Saturday (June 30). The departure of Pettit, Kononenko and Kuipers leaves only three residents to currently occupy the space station until three new crewmembers launch to the complex on July 14. Padalka, NASA astronaut Joe Acaba and Russian cosmonaut Sergei Revin will remain aboard the orbiting outpost until September. Russian space station flight controllers radioed Padalka and his Expedition 32 crew after today's landing to let the spaceflyers know their comrades were safely back on Earth and in good health. "Good to hear," Padalka radioed back. "Another mission completed."